What is the real cost of war? On just one day in September 2001, 2,996 people lost their lives when the twin towers fell in New York, at the Pentagon, and on the each of the three hijacked planes. When the leader of Al_Qaeda Osama Bin Laden was killed by U.S. special forces, the war on terror did not subside. In fact, the monetary costs continued each year since then at a steady rate in defense and homeland security spending. In all, the U.S. government has spent more than $7.6 trillion on defense and homeland security since the 9/11 attacks. As of April 2018 (according to the Department of Defense Casualty Report, here are casualties from the various campaigns in the subsequent War on Terrorism. Operation Enduring Freedom (OEF) - This campaign includes casualties that occurred between October 7, 2001, and December 31, 2014. The DoD reports 2,346 military deaths and four civilian deaths, with a total of 20,095 injured in and around Afghanistan. There are other locations in the world that are classified within the OEF spectrum. These include deaths and injuries in Guantanamo Bay (Cuba), Djibouti, Eritrea, Ethiopia, Jordan, Kenya, Kyrgyzstan, Pakistan, Philippines, Seychelles, Sudan, Tajikistan, Turkey, Uzbekistan, and Yemen. 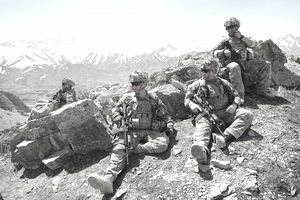 Operation Freedom Sentinel (OFS) - This campaign includes casualties that occurred in Afghanistan immediately after OEF concluded December 31, 2014. OFS began on 1 January 2015. To date, there are 49 U.S. deaths and 268 wounded in this current military operation. Operation New Dawn (OND) - This campaign includes casualties that occurred between September 1, 2010, and December 31, 2011. There were 73 U.S. deaths and 295 wounded in this operation. These deaths occur in the areas of the Arabian Sea, Bahrain, Gulf of Aden, Gulf of Oman, Iraq, Kuwait, Oman, Persian Gulf, Qatar, Red Sea, Saudi Arabia, and United Arab Emirates during the dates above . Operation Inherent Resolve (OIR) - Effective October 15, 2014, OIR was created to wage war against the terrorist group the Islamic State in Iraq and the Levant (ISIL, another name for the Islamic State) along the Syrian-Iraqi border. To date, there are 62 U.S. deaths and 64wounded in OIR. OIR campaign includes casualties that occurred in Bahrain, Cyprus, Egypt, Iraq, Israel, Jordan, Kuwait, Lebanon, Qatar, Saudi Arabia, Syria, Turkey, United Arab Emirates, the Mediterranean Sea east of 25° Longitude, the Persian Gulf, and the Red Sea. The Army (including the Army National Guard and Reserves) comprises 49 percent of the total DoD force but sustained more than 70 percent of the combat deaths in Iraq and Afghanistan. The Marine Corps (including the Reserves) makes up only 10 percent of the total DoD force but experienced 23 percent of the combat-related deaths. The Navy (including Reserves) make up 19 percent of the total DoD force and sustained over 2 percent of the total combat casualties. The Air Force (including Air National Guard and Reserves) comprises 21 percent of the total DOD force and experienced just over 1 percent of the total casualties. The active duty forces comprise 55 percent of the total DOD force and have experienced more than 80 percent of the total deaths in Iraq and Afghanistan. The Reserve forces (Reserves and National Guard) make up 45 percent of the force and received nearly 19 percent of the total casualties. Just under 3 percent of the total fatalities were women, who make up 16 percent of the total DOD force. Men, who make up 84 percent of the total force experienced 97 percent of the deaths in the two theaters of operation. In contrast, during the First Gulf War (1990-1991), 382 American service members died in-theater, 147 (38 percent) of those a result of direct combat. During the Vietnam War (1964 to 1975), there were 47,413 U.S. Military battle-related deaths, and 10,785 service members died from other causes. In the five years of World War II (1940-1945), 291,557 American troops lost their lives in combat, and 671,846 were wounded.